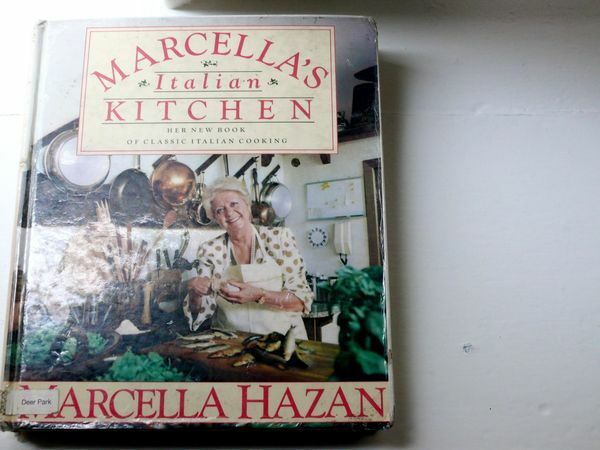 I’d had Marcella’s Hazan’s book on hold at the library for weeks and it finally came in. I’ve already narrowed down what I want to make from it this weekend and I’m not surprised that it’s some of her simpler recipes–they seem to be the most intriguing. After all, it was her 3-ingredient tomato, onion and butter sauce that first drew me to her. And having learned a little about her before reading this book (there are some links to interviews with her in an earlier post), I shouldn’t have been surprised to read such bold procurements in this book like “If I had invented pasta salads I would hide.” Well then! It’s an interesting read. But back to the recipes. 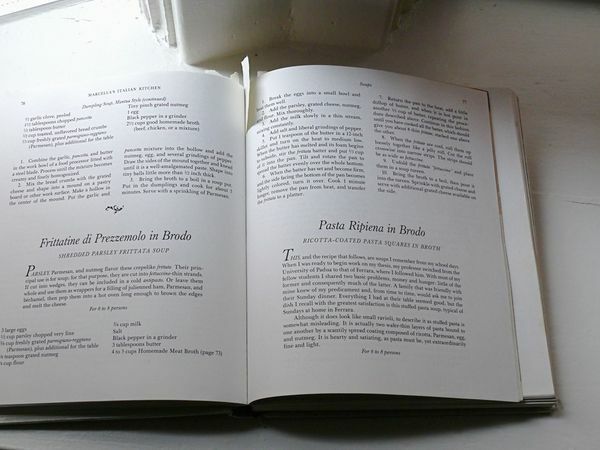 I’ve bookmarked some for stuffed, fried vegetables including onions, zucchini and chard stems, an odd-sounding potato custard (yes, like a cream dessert), and especially pasta ripiena in brodo: ricotta-coated (as opposed to stuffed full of) pasta squares in broth. Outside of this book but also on my list of things I must make is this vegetarian gumbo recipe, which is eaten during lent. I have three more weeks until Easter, I think. It intrigues me– with 5 whole bunches of smothered dark greens, and a roux base with Cajun spices it makes me think it’ll be a good approximation of the real thing. I chickened out of making this birthday cake last weekend (maybe another time), but I thought I’d share it with you. It looks like the epitome of the birthday cake, doesn’t it? I did, however, make this amazing ice cream sandwich cake, and highly recommend this simple recipe if you ever want to make a homemade version of the usually store-bought treat. And I can also recommend that you make this mushroom and farro salad with Parmesan, just as I have at least 3 times since I discovered it. What are you cooking these days? If you’ve seen something incredible or made something that blew your mind, please share.